There are more than 800 projects on OpenNTF which is more than on other popular open source sites which have less but bigger projects. The big number of projects makes it sometimes hard though to find the projects you are looking for. That's why Christian Guedemann has improved our projects page which provides different ways to find projects. In addition to Google searches via the search box in the upper right corner, there are three other ways. 1) The combobox allows selecting a project by name. The combobox now shows all projects again as supposed to the 'active' ones. We received feedback that people were confused what 'active' means and why certain projects didn't show up there. 2) With the search box projects are returned that contain the search string in the project description (partial match). The search string can also be passed in via URL, e.g. 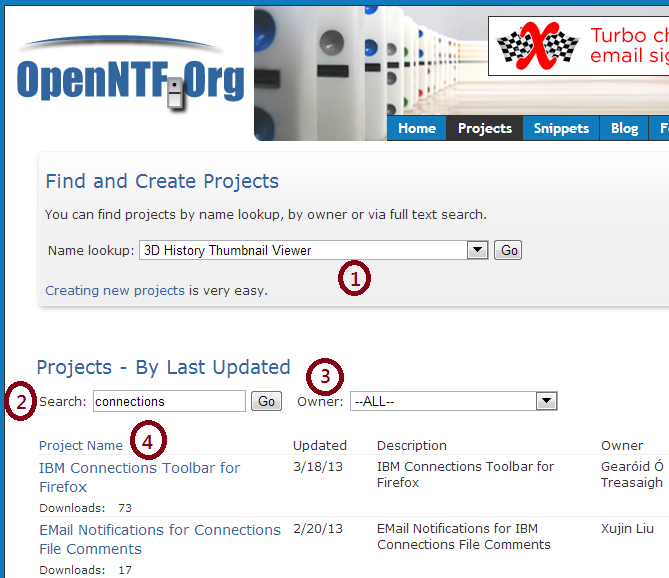 http://openntf.org/Internal/home.nsf/projects.xsp?query=connections. 3) When the owner combobox is used, only projects of that person are displayed. The results of (2) and (3) are displayed below the textbox and combobox. By default they are ordered by the date when the projects were last updated. The sort order can also be changed to project name via (4). With these new ways to find projects, we could remove the old views with view paging functionality.